Any story written about New Jersey first addresses either its adversarial reputation, its relationship to the New York metro area, or its most famous exports: The Sopranos or Bruce Springsteen. What we should be talking about is breakfast meat. Thanks to Jersey’s bombastic reputation, celebrated restaurants enjoy a larger-than-life devotion: Benny Tudino’s Pizza in Hoboken, White House Sub Shop in Atlantic City, Dosa Hut in Jersey City, White Manna burgers in Hackensack, The Hot Grill’s Texas weiners in Clifton. These icons have been good enough for plenty of TV shows and newspaper profiles, but breakfast is true Jersey. With 500,000 estimated commuters rushing out of the Garden State for work, N.J. has turned the morning meal on the go into an art. And its masterpiece is pork roll. Deeply treasured by New Jerseyans, pork roll (also known as Taylor ham) is polarizing in title, but its salty appeal is shared by the state’s diverse residents. It’s a particularly localized entry in the taxonomy of sliced American breakfast meats, one nearly impossible to find outside its native habitat. Exactly what makes this meat so cherished? It’s rich, salty, and sumptuous, as ground and formed pork shoulder with a hefty fat content amply carries its added seasonings. A slight sweetness helps to form an extra-strong Maillard reaction when pork roll is fried up on a flat grill, preferably at your favorite local diner. A quick warning: Pork roll may resemble Canadian bacon, but you’ll be greeted with a tough stare—or worse—for comparing the two. 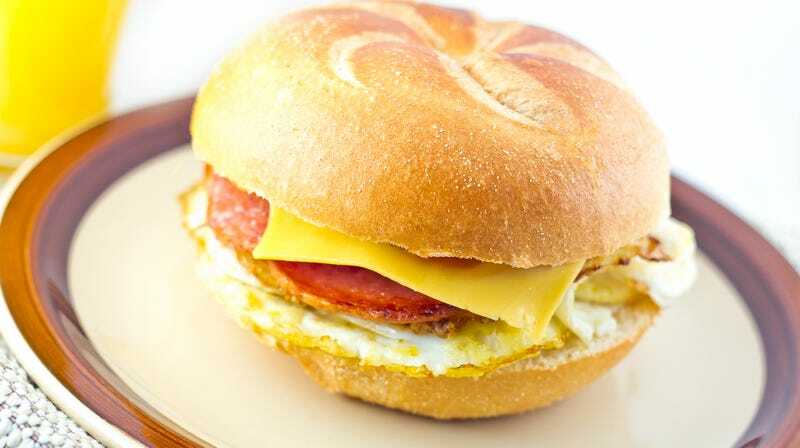 Though native to Jersey, it’s also available and primarily produced in other states, including neighboring Pennsylvania where much of the pork roll New Jersey eats is made. It’s also offered at the Pennsylvania-born convenience store chain, Wawa, prevalent in the Mid-Atlantic states. Regardless of its larger presence, pork roll is associated with New Jersey to such a degree that President Obama even joked about the ongoing feud over its nomenclature on a 2016 visit to the state: “I come here today for a simple reason… to finally settle this pork roll versus Taylor ham question,” he said at a Rutgers University speech without picking sides. Thanks, Obama. Whether you call it Taylor ham, in reference to its creator, New Jerseyan-of-note John Taylor (as people do north of the Raritan River), or pork roll like the entire bottom two-thirds of the state, it’s more than a breakfast meat—it’s an institution. Dreamed up in 1856 at a time where preserving meats was vital to human winter survival, it still forms part of the state’s identity. With Jersey’s sizable Italian-American population, cured meats are already a regular staple, probably lending to its continued embrace in the state. In my neck of the woods, we grabbed the PEC (pork roll, egg, and cheese, in Jersey-speak) on a hard roll from a deli en route to Bradley Beach in the summer. It was a hot meal that perfectly prepared us for hours of getting slapped around by the Atlantic Ocean, savory and filling enough to ward off lunch as long as possible, a mom’s best friend. Its expanding appeal is good news for homesick New Jerseyans forced to eat breakfast sandwiches with ho-hum bacon and standard sausage—all the while pining for a fried slab of home.